The Big Agnes Copper Spur UL1 is rugged and durable, providing the single backpacker and camper with high-quality material for a decent price. The UL1 is popular among experienced campers for its ideal combination of light weight without sacrificing sturdiness or space. 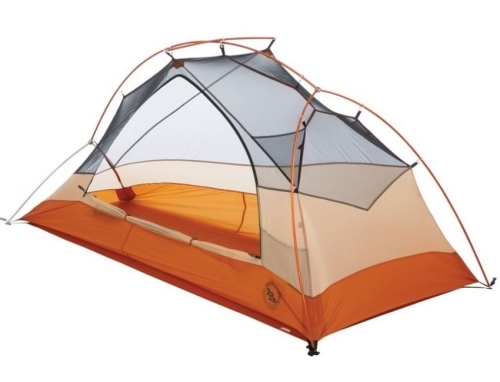 It's actually an extremely roomy tent for 1 person, with a vestibule for storing your pack, boots, and more, 90" of length for plenty of legroom, and 37" of headroom height for an altogether comfortable interior. The Big Agnes Copper Spur also comes in the UL2, UL3, and UL4 sizes, each designed for the number of people in the the model number. This dual vestibule tent is designed for the individual enthusiast to take with them on a short or even long term backpacking trip and pitch in a snap. 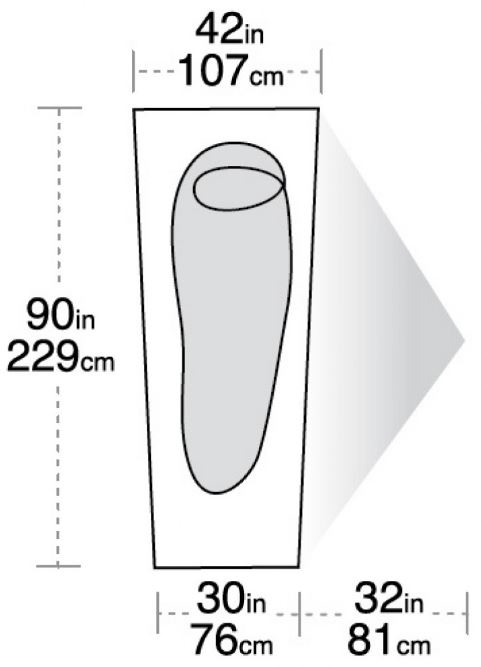 The tent’s roomy upper section provides room for the average sized person to sit upright in. The 90 inches in length provides room for someone to rest comfortably, without needing to curl into a fetal position to avoid having their feet hit the ends. The vestibule offers 10 square feet of space near the large D shaped tent flap. A small included gear rack by the head offers a little above ground space, with optional gear racks available for the top and side of the tent. An optional footprint is available for rough terrain. 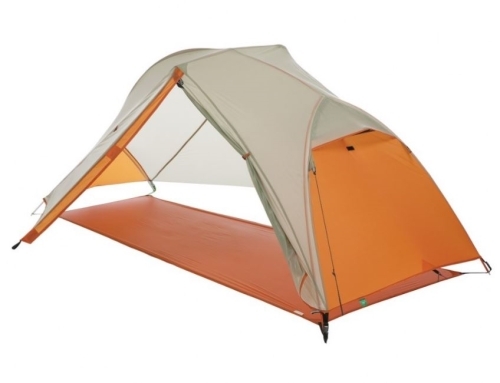 The pitching process of the Big Agnes Copper 1 Person Tent is designed to be quick and easy. The fast design depends primarily on a single pole, which is easily clipped in place along the tent frame. A secondary pole provides cross support. The rainfly comes with color coded hooks and eyes. Reports from arthritis sufferers claim that the tent is even simple enough to pitch without help, even with arthritic fingers. 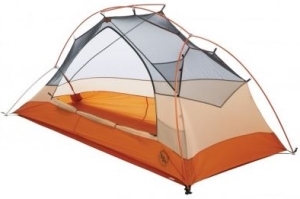 The Big Agnes Copper Spur UL1 Tent is designed to be roomy and comfortable, with a spacious width of 42 inches at the head and 30 inches at the foot area. The fact that an average adult male can sit upright within it without hitting his head puts this tent above many other one person designs. The roomy vestibule provides ample space for storing a backpack or other basic gear and boots. The ventilation of this model depends on mesh walls that let the air through without allowing the water in. This mesh coating is very fine, and has been reported as easy to damage with sharp objects. Once damaged, the mesh has a tendency to run like a pair of hosiery. However, the rainfly protects against this damage when used properly. Weatherproof options have proven sufficient, with multiple reports of remaining dry within the properly pitched tent, even when a puddle of water formed beneath the tent overnight and in extended rain showers. 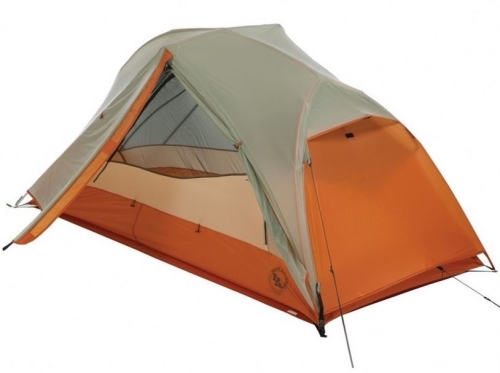 The Big Agnes Copper Spur UL1 Tent is surprisingly light, even when backpacking. Weighing in at a mere 2 pounds, 12 ounces in the original packaging, it can be transformed to 2 pounds 6 ounces when packed without the container. For those who are really pressed for weight, the flysheet option reduces the overall weight of the tent to 1 pound, 14 ounces. This, of course, assumes that the main body of the tent is left behind. As far as tent prices go, the Big Agnes Copper 1 Person Tent can be a little out of some people’s price range. With sale prices as low as $250, this usually $350 tent can encourage some people to spend their money elsewhere. However, those who have taken the financial plunge generally report being happy with their price commitment. If you’re tight on cash, though, you may want to look for a different unit or wait on a sale. An excellent investment for the serious enthusiast, this tent is easy to pitch and easy to carry. This makes it wonderful for backpackers and car campers alike. This 3 season tent won’t keep you warm when it’s snowing outside, but it will allow you to sleep comfortably and even have room to change your clothes without needing to worry about rubbing against the walls and struggling too much. Those who purchase this tent ultimately agree that it is a great value and well worth the investment. Packed Size 6" x 16"